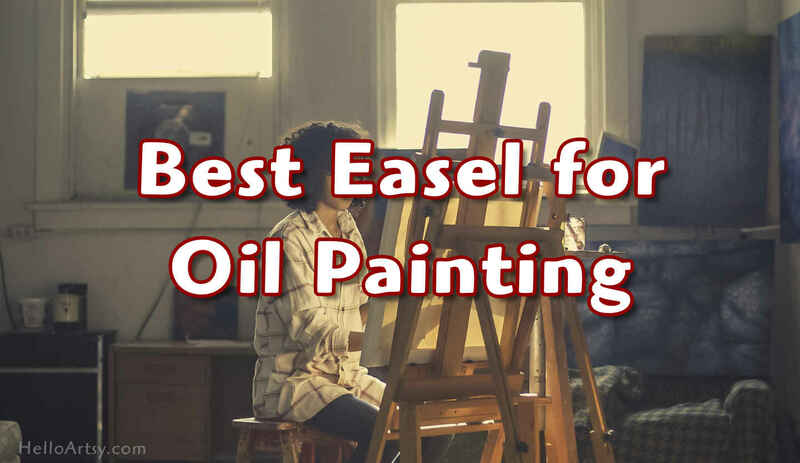 Here’s my take on some of the best easels for oil painting. I’ve reviewed some of the popular artist’s easels that are available on the market today. Find your next painting easel for your studio based on your current studio setup and budget! 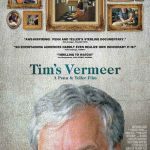 After painting in oil paints for the past 25 years I’ve come to some conclusions about the various easels that are available for your painting needs. From premium wooden easels to metal student-grade artist’s easels I’ve used countless brands and styles of easels over my painting career. I’ve even painted on my share of homemade easels as well. This could easily be a 50 page article, but I’m going to keep things simple so you can choose an easel and get back to painting! 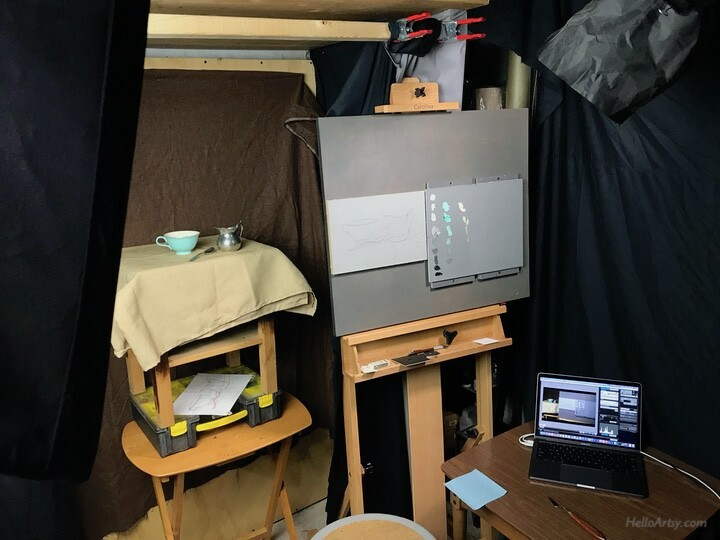 Below, in this article, I’m reviewing full-sized studio easels. You know, the kind you would want parked in your oil painting studio. These are the types of easels not designed for travel or plein air painting. You can actually get a lot of easel for your money if you just know where to look and what features to look for. 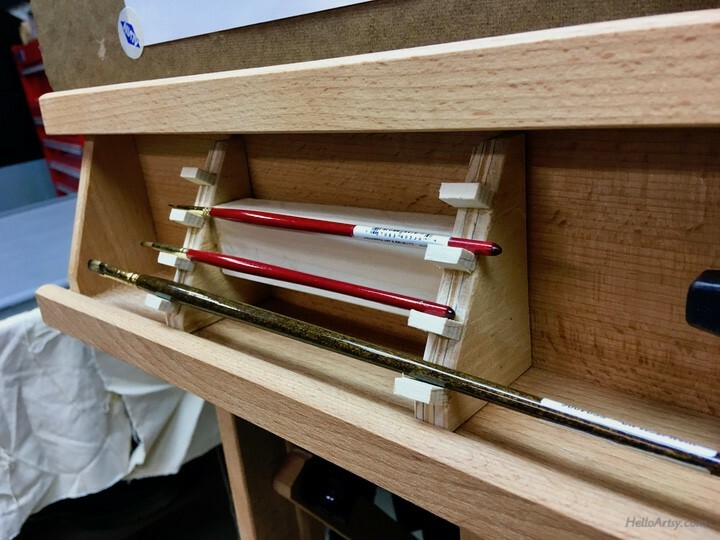 I’ll even share with you some of the modifications you can make to your easel to make it more efficient. Your specific oil painting studio set up and the needs of your painting style will help you pick your next easel. I wouldn’t try to get a single easel for both your travels and your studio. Travel easels are designed to be light and portable, which is generally what you won’t appreciate when painting in your studio. If you paint both outside and in your studio, I would strongly suggest getting an easel for both occasions. When faced with the array of studio easel choices you’ll find mostly that they come in either an “A-Frame” style or an “H-Frame” style. The H-Frame painting easels tend to be larger, heavier and have more adjustments. For this reason the H-Frame easels are really my preferred style of oil painting easel. But, if your space is absolutely tiny and you need to frequently tuck away your easel, then a A-Frame easel may be just what you need at this point in time. Some of the more expensive painting easels will adjust to a horizontal position. 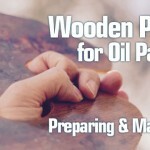 This could prove useful when varnishing paintings or if you prepare your own painting surfaces with acrylic gesso, etc. 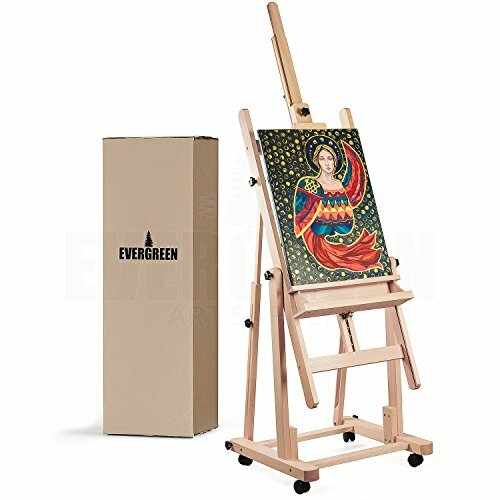 If I had a huge painting studio and some extra cash I would be happy with the Heavy Duty H Frame Wooden Art Easel by Evergreen. It has an adjustable center-mast that slides out allowing the easel to span a full 139 inches. One of the unique features of this easel is in its ability to tilt forward. 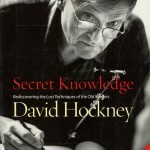 This could be useful if trying to paint into the glare of your slick oil painting surface. 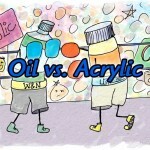 If you work with oil painting glazes you’ve surely encountered this problem of starring into a glare and trying to avoid the glare by looking at your painting from the side. A slight tilt forward could help alleviate this. The metal adjustment track is also a very durable feature that most cheaper easels don’t have. This easel will adjust to a horizontal position. The Extra Large Double Mast Studio by US Art Supply is a unique wooden easel in that it’s a H-Style easel but more like a double-H of sorts. I could see the double mast being quite handy if you work from referrences or find the need to have two panels on your easel at the same time. Or perhaps you want to position your palette vertically alongside your painting like I did in this training video. 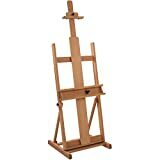 This double mast easel also will adjust into a horizontal position and will accommodate paintings up to 83 inches tall. The Carolina H-Frame Studio Easel by Creative Mark is a simple wooden easel. It’s the easel I own and use constantly. While it doesn’t have many features this is its main selling point. 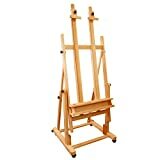 You get a lot of value from this easel and for the money it really is one of the best easels at this price-point. The carolina will support artwork up to 102 inches in height. With no wheels this easel stays put, but if you constantly have to move your easel from one end of your studio to the other then this may not be the best choice for you. The fact that it didn’t have wheels was actually one of the reasons I bought and use this easel almost daily. Just starting out and don’t want to invest a ton of money into your oil painting studio setup? If you are on a tight budget and an extremely limited budget you’ll find the Sunset A-Frame Easel by US Art Supply to be a good addition to your oil painting studio. 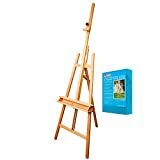 This adjustable easel will accommodate a painting up to 50 inches in height. Not bad for an A-Frame style easel. You’ll notice right away that this easel, compared to the other H-Frame models is smaller and folds up easily. If you paint in your bedroom or studio apartment and need to constantly tuck your easel away, this is a good oil painting easel for you. If you have a bigger painting studio and can let your easel stay put, you’ll be much happier with one of the larger, heavier easels reviewed above. For years I used a Stanrite 500 aluminum easel. The reason was simple: these painting easels were cheap at the time I was stocking my commercial art studio where I would teach drawing and painting classes. I needed to buy 15 easels for students. So at that time I got one for myself and just kept using it. I also needed these easels to be folded up and put into storage daily. Back then the trusty old Stanrite 500 cost about $50. But since the cost of most metals have increased, this aluminum easel has nearly doubled in price since then. I can’t recommend it anymore. There are much better easels for the money. 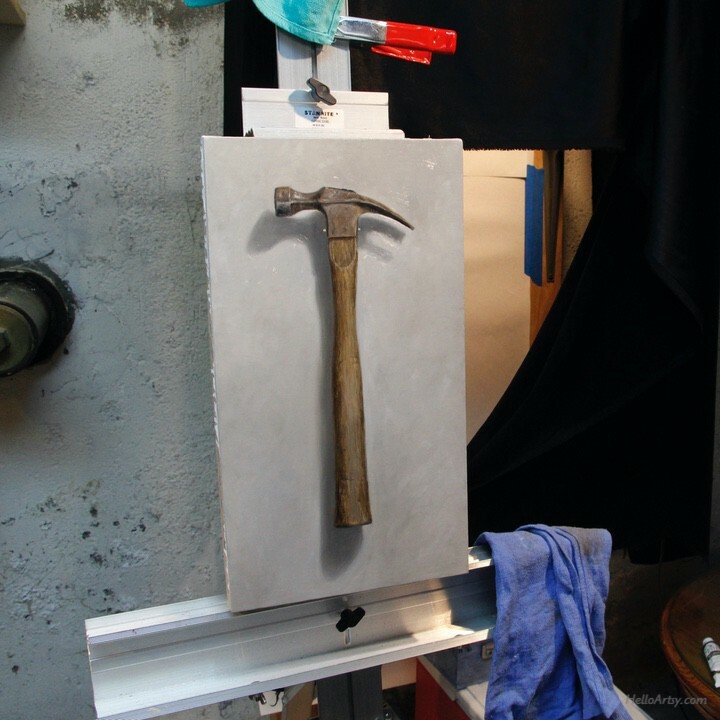 Here’s that old metal easel with one of the first tool paintings I made. I like big heavy studio easels. You can lean on them without your artwork moving around. The current easel I use for everyday oil painting adventures is the Carolina Easel made by Creative Mark. I first encountered this easel when I was touring the Academy of Realist Art in Boston. Julie Beck, the assistant director of the school had a couple of these easels in her studio. When I saw just how well built the Carolina easel is and the affordable price, I had to have one. You know you want one! It’s easy to make with some plywood and wood glue. Most full sized studio easels will present some issues when working on tiny canvases or panels. I recommend using a larger panel of wood behind your small painting as a workaround. This way your small painting stays put and doesn’t move or worse, fall between the easel’s framing which can easily happen with really small paintings. Sometimes you need to just modify your oil painting set up just a bit to suit the surface you are painting on! The panel I painted on for the “Tea Time” video series was 8 x 12 inches. That’s quite a small size painting surface to use with most of these large studio easels. In the photo above you can see how I temporarily glued the painting to a larger board to the left of the glass palette.